The 2019 International CES show started today in Las Vegas, and it will end on Friday, 11 January. CES is the world`s gathering place for those who thrive on the business of consumer technologies. It has served as the proving ground for innovators and breakthrough technologies for 50 years. This is the global stage where next generation innovations are introduced to the marketplace, and its owned by Consumer Technology Association (CTA). This gathering attracts the worlds business leaders and pioneering thinkers. I have been following Apple for decades and I expect them to be in Las Vegas this week. We all know that AI is the future, but how is Apple`s innovation when it comes to Smart home tech? It seems like they are falling behind in the Smart home race. Both, Google and Amazon are now integrating Alexa and Google assistant into Smart home devices. Voice assistants are cropping up in all kinds of places at CES 2019 and what I think is a cool thing to have is both voice and touchscreen in the bathroom mirror. This Smart Mirror allows you to access Google Assistant were you can check the weather and traffic, or stream some YouTube videos while you are fixing your hear before you are going out for your next date. Its brilliant because you have only two hands and none of them are free. Youre fixing your hair right. So, while you`re fixing your hair, you just have to ask the mirror what time it is, what the weather is or when your next bus is coming. All this without using your hands. Everything is connected and to do so you need 5G, which is enabling the Internet of Things (IoT). Cars, heating systems and even trash cans are becoming involved in the net. 5G is super fast and makes the IoT possible. 5G is 100x faster than 4G and 10x faster than the best home-subscriber broadband service. You need 5G to run your new driverless car and it`s all based on a computer with GPS built-in it. 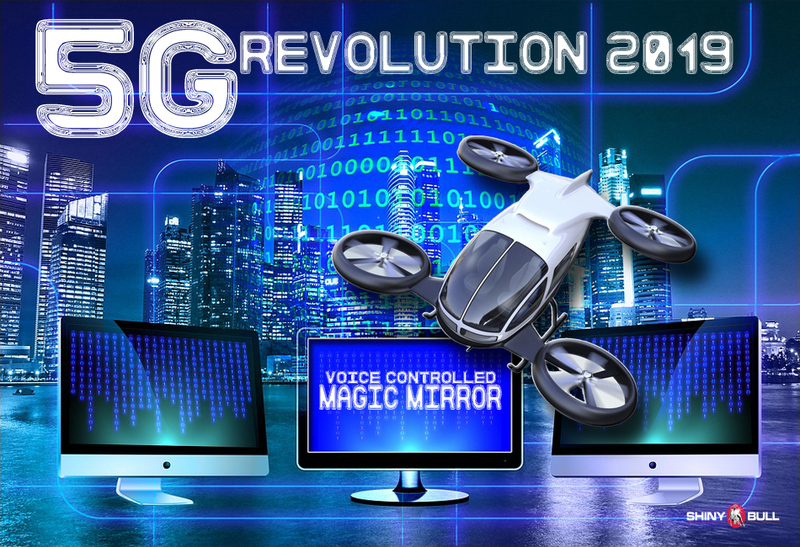 5G is nothing less than a revolution. It is in such capacities that it becomes clear why the technologies from 2G to 4G differ so radically from the fifth generation, and that is awaiting us is partly a new beginning and partly a turning point, but certainly nothing less than a revolution. Disclaimer: The views expressed in this article are those of the author and may not reflect those of Shiny bull. The author has made every effort to ensure accuracy of information provided; however, neither Shiny bull nor the author can guarantee such accuracy. This article is strictly for informational purposes only. It is not a solicitation to make any exchange in precious metal products, commodities, securities or other financial instruments. Shiny bull and the author of this article do not accept culpability for losses and/ or damages arising from the use of this publication. Click the button below to receive new posts by email.